The meditative practice of calling to the divine through chanting in song, in our heads or by listening, creates a bridge between the individual and something much greater, opening the heart and welcoming the spirit. Mantra is a powerful unifying force, allowing us to join the stream of consciousness that is what our heart truly desires, and there for what our highest self really needs. A simple reminder that we are not as separate as we think we are. The most common way to begin a mantra is just to repeat it to yourself over and over again - out loud in a low mutter and then eventually silently in your head until it becomes less about the words and more about the repetition of a vibration. This is where mala beads come in handy. 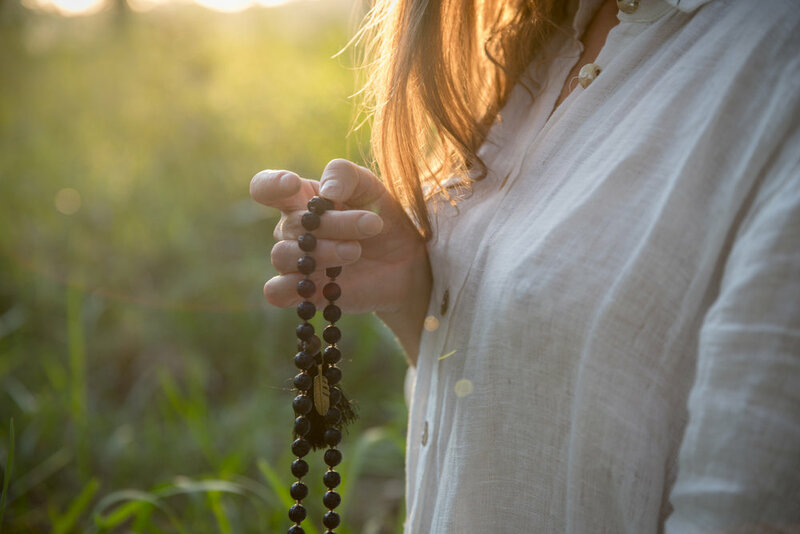 A string of 108 beads with a 'guru bead' that you can feel as you complete a round of 108 repititions of the mantra, rolling the beads through your fingers as you chant each one. The options are unlimited! There are particular lineages that initiate you, meaning you have a mantra that is yours to use always. You may have one already! It could also be a phrase, affirmation or intention in english that is appropriate for what you are working on in your life. Here are a few for you to get a sense of what might feel right for you. Om. Earth. Atmosphere. Heaven. May we focus our awareness, on the alluring radiance of the rising sun. May it inspire our thoughts and meditations. Our creation, the duration of our lives, our trials, tribulations, illnesses, calamities and the death is the guru. There is a guru nearby and a guru that is beyond the beyond. I make my offering to the beautiful remover of my darkness, my ignorance; To these teachings, it is to you I bow and lay down my life. I bow to the bestower of wisdom, intelligence, knowledge and creative artistic energy. 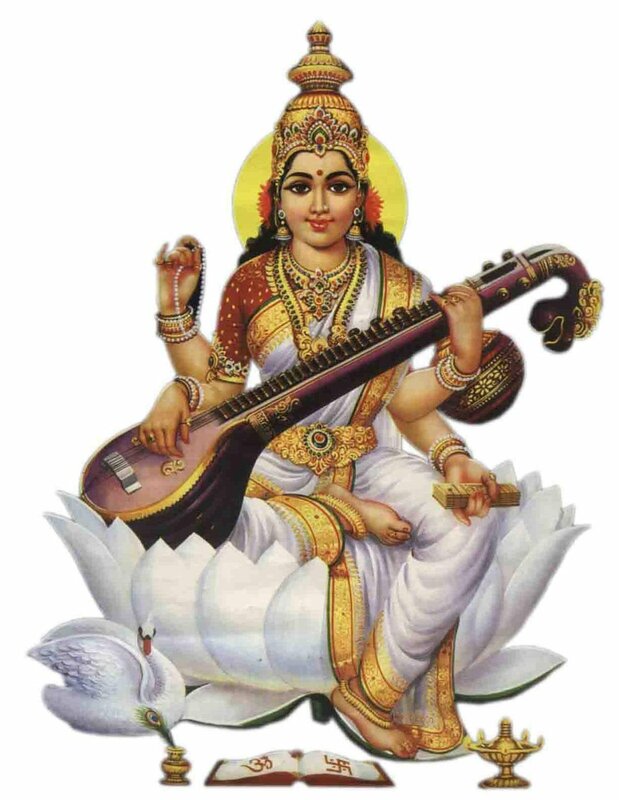 Saraswati is the goddess of learning, art, dance, and music. She offers us the powers of speech, wisdom and creativity through her power of eliminating lethargy, dullness and ignorance. We can call on Saraswati when we are studying, creating art, or calling on new inspiration for our creative expression. This is one of many mantras dedicated to the qualities of our friend Ganesha. As the ruler of the earth element, he sits in our roots, at Muladhara Chakra. He reminds us to keep our feet firmly planted on the ground even as we strive to open to the higher consciousness within and around us. Ganesh is invoked at the beginning of a practice session, a day, a new venture or a journey to offer us the strength, courage and compassion we need to remove obstacles outside us and obstacles we place in our own path. Need some Fierce Compassion? Call on Durga, the embodiment of feminine power in action. For protection against internal or external negative forces she will come in like a mother tiger protecting her cubs. Seen riding a tiger, Durga’s many arms hold weapons to lead the vanquishing of evil forces in the world. As a warrior goddess she destroys illusion and challenges mankind from it’s complacency. Material, spiritual and emotional abundance Lakshmi is the energy providing for the health and welfare of the family. 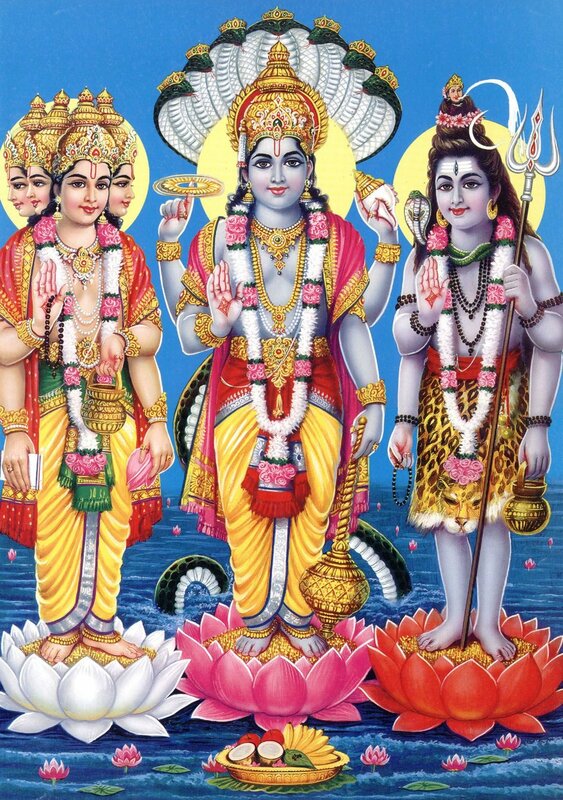 Through Lakshmi we drop deeply into the knowledge of what we have, rather than what we lack. Grateful; we see that we already have enough. We can also call on Lakshmi in times of transition, calling for luck and prosperity in changing our jobs, moving, starting new ventures and in all ways we transition through life.